With the 2000 vintage garnering all sorts of great reviews for Bordeaux, Burgundy, as usual, is a world apart. The growing season began nicely, with warmer than normal temperatures in May and June. July, though, saw a considerable amount of rain, with summer making its return in August, pushing the grapes towards maturity. September saw a bit of variable weather, though many producer in Puligny-Montrachet reported a good quality harvest. We assembled a good range of wines, all but one being a Premier Cru level bottling. The results of the tasting are quite interesting. One wine was significantly ahead of the pack, though it was hardly a unanimous verdict. Second through eight place were separated by a small margin, a mere 14 points (with 17 tasters voting, this is a very tiny margin). Even the last place wines had a significant number of fans, with a few people ranking these wines in first place! One proponent of the wine found "big, ripe, citrusy Chardonnay fruit and notes of lees, grapefruit and toasty oak." Others liked its notes of "ginger and sulfur" and "honeysuckle." But several had problems: "blah wine," "flat and light", "no focus, structure." Another critic found "sweet brown sugar and oxidizing notes, borderline defective." Another found that the wine "comes off more like Meursault than Puligny" (a good point). Bob got sentimental. "It reminds me of low-tech Puligny of yore: very leesy (forest underbrush) and giving an impression of oxidation (old style) with floral notes and hints of white chocolate; very special! Plenty of leesy notes on the palate too. A nice mouthful of Chardonnay fruit; full, ripe, and long." 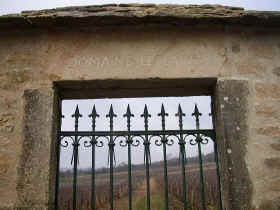 Gerald found the Jadot to have "more ripe apple fruit and less elements of maturation on the spent yeast. It's a simple wine on the nose and a shade more impressive on the palate. One star rating on my three star scale, no stars being an ordinary or standard quality wine." 7TH PLACE: LOUIS CARILLON 2000 PULIGNY-MONTRACHET "Les Referts, 1er Cru"
The wine found favor with several tasters; "Bright, clean, a hint of Botrytis and lychee nut (to which several said "yes!)" "There are exciting aromatics, including lime and pear, but high pitched acidity brings it down." Another pointed out a "hint of amber in the color of the wine with ample minerals and citrus notes of lemon and lime and a detracting note of unripened peaches on the finish." Another added "juniper on the finish." 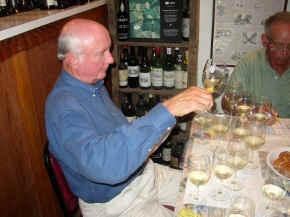 Bob found the wine to have a "sulfur edge to the citrusy (lemon especially) Chardonnay fruit; moderately toasty oak; a tad of honey (yes, from Botrytis) and ripe fruit but it fades dramatically. There's decent fruit and acid on the palate but the wine has little to say and has a flat aftertaste." Gerald found the Carillon wine to have "ripe apple fruit with hints of pears...a touch of vanilla...more like a standard white Burgundy than Premier Cru level wine. 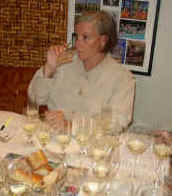 On the palate the wine is a tad austere leaning more in the direction of Chablis than Puligny." 6TH PLACE: ETIENNE SAUZET 2000 PULIGNY-MONTRACHET "Champs-Canet, 1er Cru"
One taster characterized the wine as having "nice fruit, minerals (Chablis-like) and good structure." Another liked its "fruity nose with hints of apricot and licorice. It opened up nicely for me." Detractors found "a short finish," "too hot!" and "a piquant sour apple note." Bob found "toasty, smoky oak, minerals; the shy Chardonnay fruit dukes it out with the oak (nicely!) The wine is tight in the mouth with a slightly uncomfortable acid. It has length but the fruit isn't saying much at the moment. It probably needs time!" 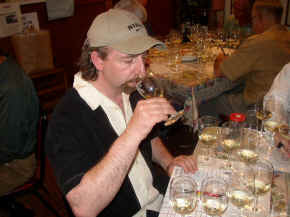 Gerald encountered some "lovely smoky, toasty notes on the nose with a touch of pear fruit and a leesy element. Yet the wine is a bit shallow on the palate and less toasty in flavor than I would have liked. One star rating." 5TH PLACE: PAUL PERNOT ET SES FILS 2000 PULIGNY-MONTRACHET "Folatieres, 1er Cru"
One taster found a "complex wine with grapefruit overtones and hints of sulfur and smoky, toasty oak but has only modest green fruit and funky notes." 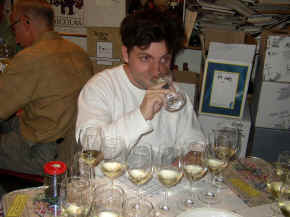 Others found "lemon zest," "lactic nose," "cream" and "a nice mouthfeel." One taster was bothered by "musky, wet hay, off aromas and flavors and flat finish." Another described the off odor as "animal." Bob found "a leesy element and nice, ripe Chardonnay fruit with hints of chamomile and sweet spice (ginger, allspice); some oak sneaks in there too! High acid (delicious but daunting), the wine is closed in and needs time. It has an orange rind finish. I'm reasonably optimistic for its future." Gerald noted "lots of appley and yeasty aromas here...very stylish. The same features shine brightly on the palate, with crisp acidity and a long toasty finish. Two stars." 4TH PLACE: PAUL PERNOT ET SES FILS 2000 PULIGNY-MONTRACHET "Les Pucelles, 1er Cru"
"Intense, focused fruit and round," said one taster, "with hints of honeysuckle and orange." Another found a "full bodied wine with notes of tropical fruits, game and smoke." Others added "oak, sulfur and cumin" and "very citrusy." Some were less impressed: "brooding, sulfury nose" and "zesty but light." Bob had mixed feelings: "toasty/smoky oak, cream from the malolactic, nice straightforward Chardonnay fruit but a bit simple. This one of the set most resembled California Chardonnay in style. It has nice acid and a bit of fine tannin from some press wine but there's a flat, tropical fruit finish; an O.K. Chardonnay but only marginally Puligny in character." 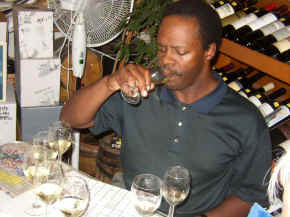 Gerald found some "nicely smoky notes here, but this wine seems more advanced or older than the rest of the field. On the palate there's a sense this wine is bigger and more alcoholic than it needs to be. The overall effect makes it a bit coarse and clumsy. One star." the wine remarked "it screams Puligny-Montrachet!" Bob agreed. There's "sweet smelling Chardonnay fruit; a nice sweet spice tone (cinnamon, clove); some 'sur lie' notes and it shows Puligny-Montrachet terroir big-time. This is absolutely class and classic Puligny-Montrachet! big, tight, full toast, easy acid and it finishes nicely." Gerald found a "lightly smoky character here. The wine is more impressive on the palate than in the nose. There's a nicely toasty quality with some effects of the battonage (maturation on the stirred, spent yeast in barrel). It's dry and crisp, refined and elegant. Two stars." 2ND PLACE: DOMAINE LEFLAIVE 2000 PULIGNY-MONTRACHET "Clavoillon, 1er Cru"
stone", "sulfur", "green apple on the finish", and "too hot." nice background of toasty oak and a hint of citrus (limes especially), nice! A nicely tight mouthful echoes elements found on the nose, its nicely concentrated fruit holding very well; terrific! Gerald found this to be outstanding. "Smoky, leesy notes on the nose demonstrate Burgundian winemaking. Classic. Easily a serious level of Puligny-Montrachet! Deep on the palate...dry, crisp, smoky, toasty, leesy and long. Excellent! Two stars +." 1ST PLACE: DOMAINE LEFLAIVE 2000 PULIGNY-MONTRACHET "Les Folatieres, 1er Cru"
One taster described the wine as "lush, long and subtle." 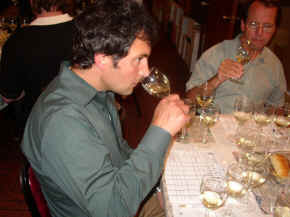 Another judged the wine "the best structured wine of the set, velvety in texture, focused, crisp but long." Another waxed eloquent: "Thick and rich, with hints of honey, cream and oak. It reminds me of buttery croissants and lemon chiffon on the finish." But it was not unanimous: "the wine's kind of flat, structure is off." And another found it "too sweet!" Bob liked its "toasty/leesy/spicy notes; very fresh smelling with hints of tropical fruits (pineapple, guava perhaps). Nice, easy acid in the mouth with some lactic notes and tropical fruit notes especially on the finish." Gerald said he couldn't find the similarity between this wine and Leflaive's Clavoillon. Still, he described this as "clean, smoky, nicely appley. The wine is more rich and fat on the palate with a touch of honey and toasty oak. Some elements make this more leaning towards California Chardonnay than white Burgundy. Still, quite a good wine. One-and-a-half stars."